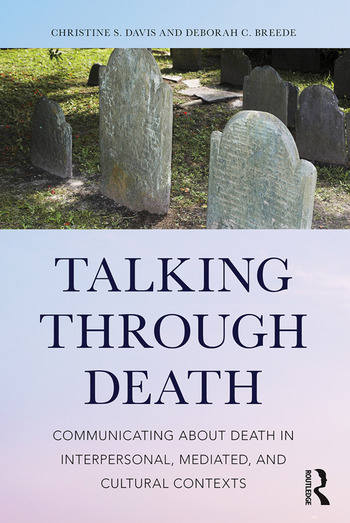 Talking Through Death examines communication at the end-of-life from several different communication perspectives: interpersonal (patient, provider, family), mediated, and cultural. By studying interpersonal and family communication, cultural media, funeral related rituals, religious and cultural practices, medical settings, and legal issues surrounding advance directives, readers gain insight into the ways symbolic communication constructs the experience of death and dying, and the way meaning is infused into the process of death and dying. The book looks at the communication-related health and social issues facing people and their loved ones as they transition through the end of life experience. It reports on research recently conducted by the authors and others to create a conversational, narrative text that helps students, patients, and medical providers understand the symbolism and construction of meaning inherent in end-of-life communication. Dr. Christine Davis is a Professor in the Communication Studies Department at the University of North Carolina at Charlotte. She received her BA degree from Virginia Polytechnic Institute and State University; her MA from the University of North Carolina at Greensboro; and her PhD from the University of South Florida, all in the field of Communication Studies. She publishes regularly on topics such as children’s health, end of life communication, disability, and qualitative research methods. Dr. Deborah C. Breede, a Professor of Communication, teaches communication, women’s and gender studies, and graduate courses at Coastal Carolina University (CCU) in Conway, South Carolina. Her primary research, teaching, and service interests focus on the formation, development, maintenance, and challenges of community within a variety of contexts – including interpersonal and familial relationships; educational, cultural, and community collaborations; and during end of life experiences.